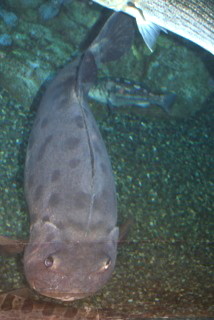 Above is a photo of a sea bass trying his best to look compassionate. Below is a sea bass' petition to change his name to something less delicious. It has been brought to my attention that my life is in danger due to my very moniker. A nemesis of mine, a tuna who now refers to himself as “Rupert,” has been taunting me lately. He points out, quite accurately I’m afraid, that “giant sea bass” sounds like something that would indeed go well broiled, baked, or grilled atop a serving of saffron basmati rice. "You're gonna fryyyyyyy," he snickers. So immature. As I’ve been captive in this seafood holding tank for weeks now, I’ve had time to fully consider this. And while Rupert is a smarmy jerk, perhaps there is some wisdom to be mined from his insults. I would like heretofore to be called “Harold” instead. No one pan fries a Harold. “Baked Harold with butter sauce” sounds wrong and unseemly. If you could kindly affect this name change before the dinner menu is printed up for tonight's meal offerings, I would be most appreciative. Also, if you could make a note that the Rupert Tartare is particularly fresh and palatable this evening, that would be truly splendid. Thank you - ever so much - in advance.